The Aid Elimination Penalty bars students with drug convictions from receiving federal financial aid for specified periods of time from their conviction dates. As originally written by Rep. Mark Souder (R-IN), it punished students for any infraction in their past. But last year, under pressure from a broad range of educational, religious, civil rights, and other groups organized into the Coalition for Higher Education Act Reform  (CHEAR), Souder amended his own law so that it now applies only to offenses committed while a student is in school and receiving aid. 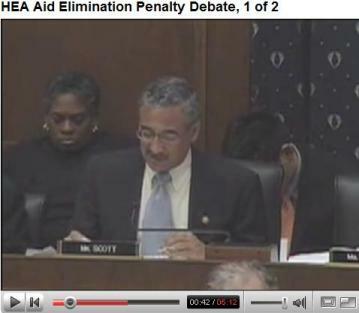 The dispute over the Aid Elimination Penalty wasn't limited to Capitol Hill committee hearings. In a move to the blunt the efforts of the penalty's foes, Souder sent out a Dear Colleague letter  where he accused the 500 groups that belong to CHEAR of being "drug legalizers," an attack that did not go unnoticed. Taking umbrage at Souder's characterization of their organizations, 16 groups responded with their own letter to Souder , asking him to retract his statement and requesting a meeting with him to explain directly why they oppose his law. "We, the undersigned organizations, would like to assure you that the coalition supporting repeal of the Aid Elimination Penalty ranges far beyond 'drug-legalization groups,' said the letter. "Last week, over 160 organizations signed a letter to Education & Labor Committee Chairman George Miller and Ranking Member Buck McKeon calling for full repeal, bringing the total number of groups in opposition to the penalty to more than 500. These organizations represent a broad range of interests, including the areas of addiction treatment and recovery, civil rights, college administration and admissions, criminal justice, legal reform and faith leaders. The overwhelming majority of signatories of the letter to Chairman Miller and Ranking Member McKeon do not endorse drug legalization. As just a small sampling of such organizations, we, the undersigned, want to make clear that opposition to the [anti-drug provision] is not in any way dependent on support for broad drug legalization." Souder has clearly shown himself to be a dogged defender of his creation. If only the Democrats had shown the same fortitude in fighting to repeal it, advocates complained. "It's disheartening that a huge chorus of experts in substance abuse and education, as well as tens of thousands of students are calling for repeal, and Congress still hasn't listened," said Tom Angell, director of government relations for Students for Sensible Drug Policy , one of the point groups in the campaign. Bill Piper, director of national affairs for the Drug Policy Alliance , was less diplomatic. "By not changing this counterproductive policy, Democrats are saying that tens of thousands of students should be kicked out of college and denied an education," he said. "The American people have moved beyond the drug war hysteria of the 1980s, but many Democrats still don't realize this," said Piper. "They're afraid reforming draconian drug laws will make them look soft on crime, even though polling shows that voters are tired of punitive policies and want change." Democrats had "chickened out," he said. In the House committee last week, Rep. Bobby Scott (D-VA) spoke eloquently about the injustice of the HEA drug provision , but then withdrew his amendment to kill it, noting that the Chair was not prepared to hear amendments that would have financial implications.